We do not eat a lot of sweets in our house, but every once in a while I have a craving for something sweet. When I do bake, I usually choose easy to assemble rustic type of desserts or snacks that I can enrich with healthy ingredients. 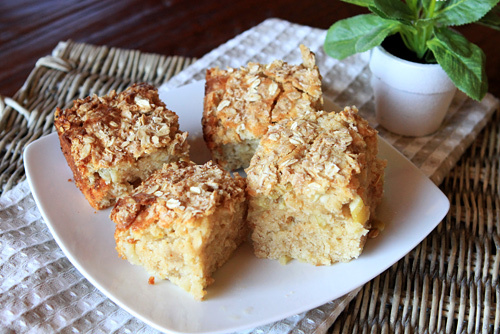 I love baking with apples as they allow you to reduce the amount of fat used in a recipe while still keeping the finished product moist and delicious. 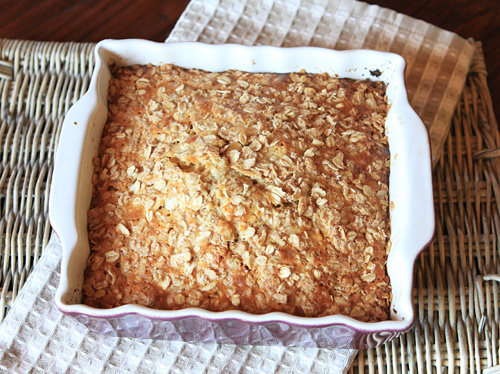 This is an easy apple snack cake that could be served for breakfast, in bag lunches, or as an after school snack. These bars have a coffee cake type of texture and turn out moist and delicious every time I make them. The use of low fat milk and olive oil help reduce the calories from fat. A portion of the white flour was replaced with whole wheat pastry flour. 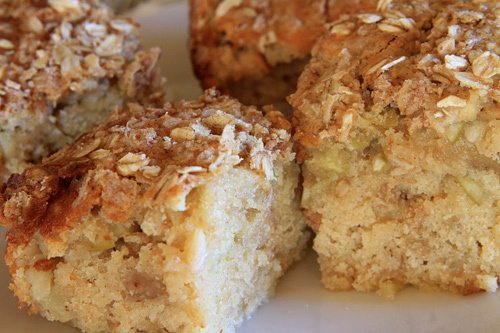 Moist apple studded snack bars that would be tasty any time of the day. Preheat the oven to 350 degrees F. and lightly grease an 8 inch cake pan. In a large bowl, add the two flours, sugar, cinnamon, baking powder, and salt and mix well. In a separate bowl, whisk together the milk, oil, vanilla, and egg. Add the moist ingredients to the dry ingredients and stir with a wooden spoon just until combined. Add the apples, mix, and pour the batter into the prepared pan. In a small bowl mix together the topping ingredients and sprinkle evenly across the top of the cake. Bake for about 40 minutes or until a cake tester comes out cleanly when inserted in the center.